Reading, UK, 26 May 2015 – HAHN+KOLB, one of Germany’s leading system suppliers and tool service providers, has selected Stibo Systems’ master data management (MDM) solution to optimise product information and media assets on around 60,000 individual products. With customers in Canada, Ukraine and China, in addition to many European countries, Ludwigsburg-based HAHN+KOLB sells from a portfolio comprising metal-cutting tools, clamping technology, measurement and testing technology, hand and power tools, machine tools and equipment for production facilities. For 15 years, the company has used a product information system and customised catalogue publication solution to manage the data for these products. Growing market demands required a new approach to mastering product data for around 30 countries in its online channels, and managing annual production of two 3,000-page catalogues in at least ten different languages. Stibo Systems’ STEP MDM solution was identified as meeting all of HAHN+KOLB’s requirements, without the need for additional configuration. Working with the company’s project management and marketing employees, along with external partners Würth IT and hoerl Information Management, Stibo Systems was able to implement STEP within nine months. 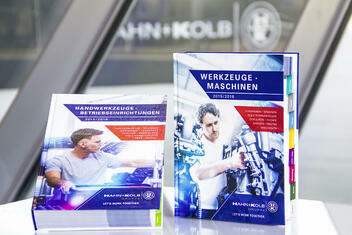 HAHN+KOLB is known as an innovative tool service provider and system supplier. The product portfolio comprises metal-cutting/machining tools, clamping technology, measurement and testing technology, hand and power tools, machine tools and a variety of equipment for production facilities. The company has a staff of 850 at its ten locations. During fiscal year 2014, HAHN+KOLB achieved growth in sales of more than 9%, primarily in the areas of production facility equipment and measurement and testing technology. Medium-sized and large companies from different industries use the services of Würth IT (formerly Comgroup). The IT service provider has more than 300 employees and offers customer-specific IT applications and consulting in the SAP environment. In addition, its range of services includes e-Business solutions, cloud services, security, and data protection. The company also offers consultancy in IT security matters and supports customers with network integration. Part of the Würth Group, consisting of more than 400 medium-sized companies, the full-service IT service provider supports numerous customers in worldwide projects, both within and outside the Group. Due to many years of experience and continuing education and training, its consultants have extensive technical and business expertise.